There have been some lovely surprises of late. This card with a tiny bobbin lace medallion that arrived for my birthday. I am trying to think how to protect it and possibly incorporate it into my life. I was thinking of maybe a key fob - one of those plastic ones that can come apart and have something put into it. Any suggestions? Another book project arrived today, too. When I asked people if they would help (in return for credit in the book, a copy of said book, not to mention my undying gratitude) all I said was "Which weave structure would you like out of this list?" and then gave them free rein as to what to do. Their efforts have far exceeded my expectations. 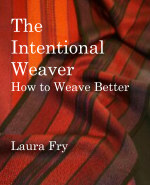 Yesterday I got an email from someone thanking me for doing The Efficient Weaver DVD. She said she'd been weaving for decades but had always struggled with getting her loom dressed. After changing her process she now finds that she can dress her loom with far less difficulty and stress. When I took a workshop with Peter Collingwood back in, oh, 1978?, he mentioned that he wrote his book on rug weaving so that he wouldn't have to travel to teach in person any more. Instead he got more requests to teach than before. I found the same with Magic. But I honestly don't expect to ramp up my teaching when I finally get The Book done. I have made peace with the fact that I really don't want to scramble, setting up tours, dealing with booking flights and all that. Instead I have chosen to focus my time and energy and let the students come to me.